It wasn't until the introduction of the Game & Watch series in 1980 that Nintendo really started doing significant business outside of Japan. For the 90 years that it had existed previously, it was catering mostly exclusively to the Japanese market only. However, in the 1960s and 1970s many efforts where already made by Nintendo to expand its business abroad, be it with limited success. The leaflet shown here is an example of such efforts. 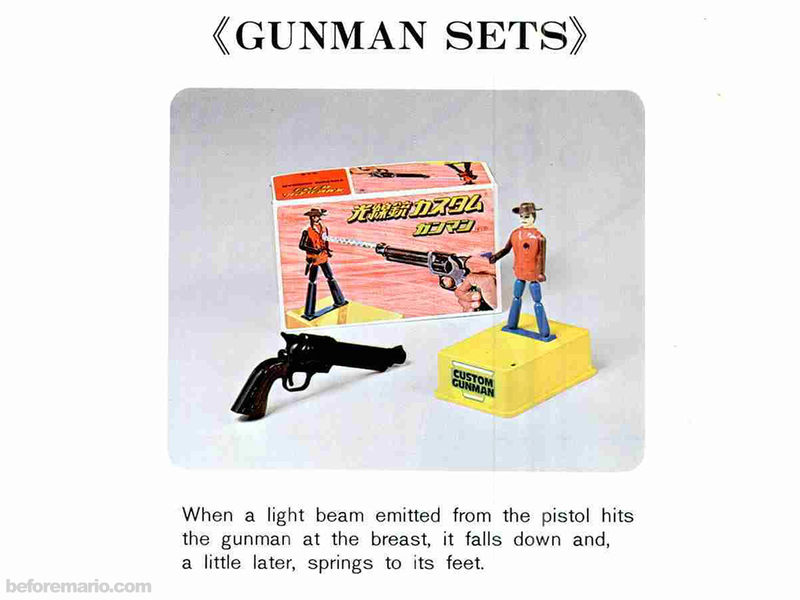 It was most likely used to hand-out to foreign game and toy buyers, and other interested sales leads, maybe at an event like a trade show. It was recently found in the archives of the United States Patent and Trademark office. The leaflet is foldable affair, printed in color on two two-sides, with six sections on each side. 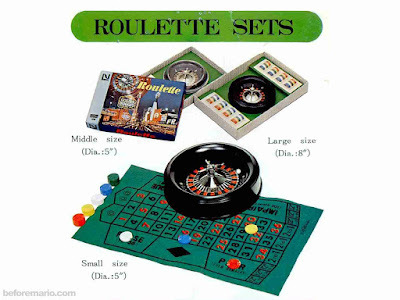 The toys and games shown include light beam games introduced in 1976, but nothing newer, so it can be dated to the second half of the 1970s. 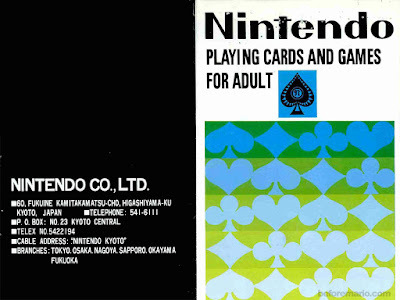 The title on the front clearly states Nintendo's target market: "playing cards and games for adult". At this time, Nintendo also produced many games aimed at children in it's home market Japan. 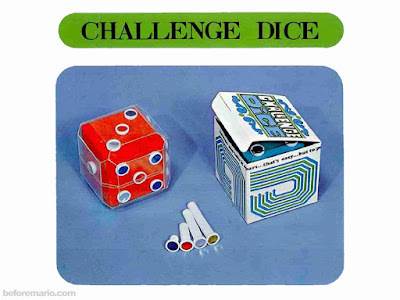 But for sales abroad it choose to focus on the adult market segment, with games mostly already known in the Western world, like cards, chess and roulette. 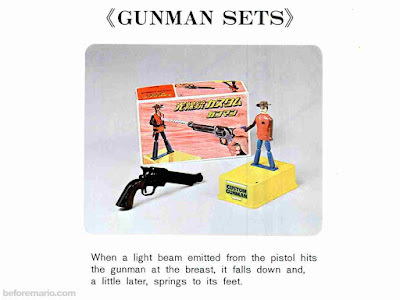 Also keep in mind that many of the children's toy that Nintendo produced and sold in Japan where adaptations of licensed American and British games, and it did not make any sense to export these back to the West. The address listed is that of the head-office in Kyoto. No contact or sales office outside Japan is mentioned, as business is still done exclusively from Japan at this time. It wasn't until 1982 that Nintendo opened it's first branch outside Japan, when Nintendo of America was founded. Playing cards are still an important part of Nintendo's foreign offering, with a quarter of the leaflet dedicated to standard cards, cards with special shapes (featuring Hello Kitty amongst others), and cards for advertisement purposes. 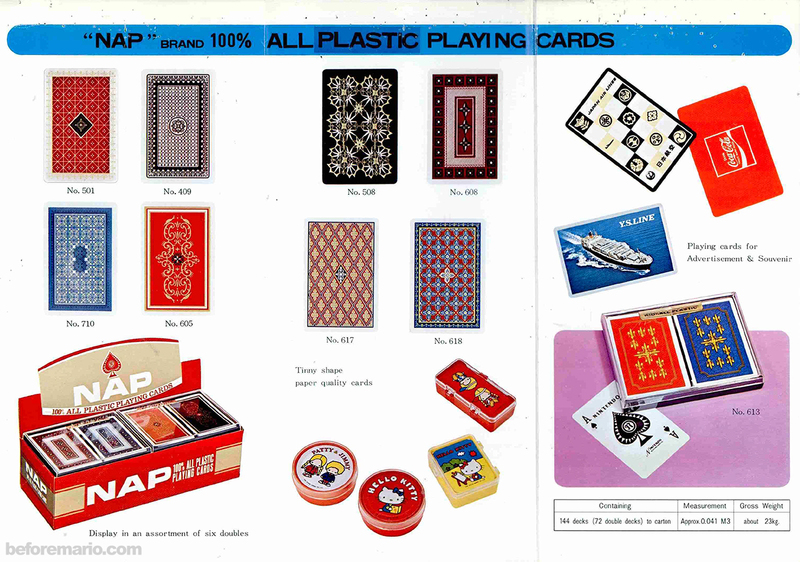 The fact that the cards are 100% "all plastic" is presented as a key selling point, also reflected in the brand name "NAP", which stands for Nintendo All Plastic. Nintendo also produced many Roulette sets in the 1960s and 1970s, and some are included here as well. 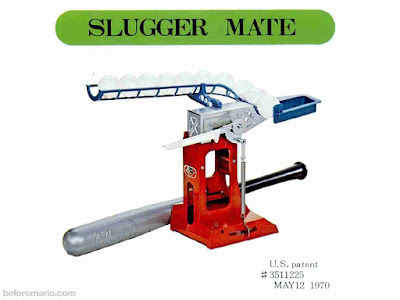 The Slugger Mate was the English name for Nintendo's domestic sales hit Ultra Machine from 1967. It represents one of the earliest attempts to expand Nintendo's market outside Japan. 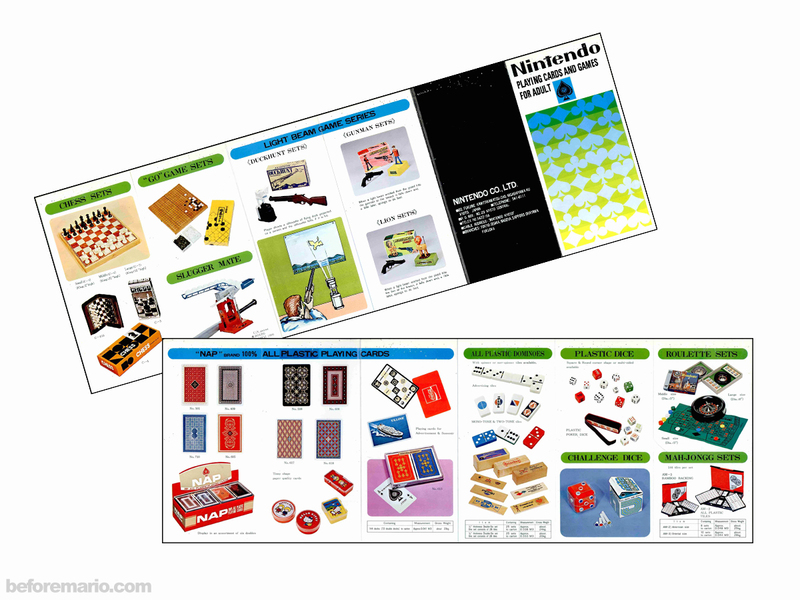 Around the time this leaflet was printed in the late 1970s, Nintendo would introduce the redesigned version Ultra Machine DX at home Japan, but here we still see the original one. The leaflet also shows the Challenge Dice, in the rarer box variant much less often found than the more common Chaotic Cube export version. 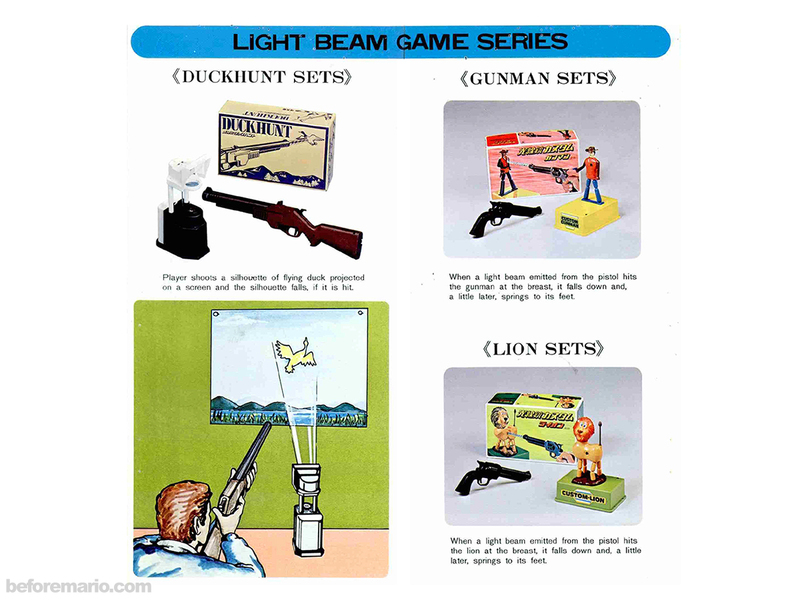 The most advanced toys included in the leaflet are the light beam games. The leaflet shows the original Duckhunt game, as well as the Custom Gunman and Custom Lion games, all dating from 1976. These light beam games are little marvels of design and engineering. 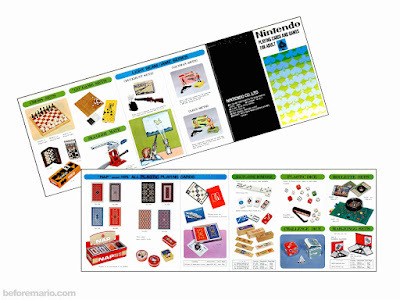 Although they did not became sales hits outside of Japan, they are early examples of the creative output that would eventually pave the way to global success for Nintendo in the 1980s and beyond. Special thanks to John Andersen for sharing the source for this leaflet. Are you sure it's real and not a fake?